The Samurai represent the essence of Japanese culture. 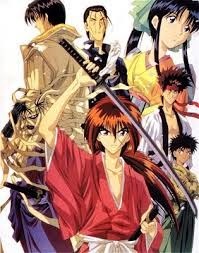 So if one is to watch Anime to learn about Japanese culture, one must definitely watch a Samurai story and ‘Rurouni Kenshin’ is one of the best in this genre. It is set in Meiji era – the post modernization period – the last era when Samurais still dominated story. The story can be called a historic romance – it centers around a swashbuckling hero Kenshin and his love interest Kamiya Kaoru. Some portion of this story follows the pattern of a typical romance story – a sweet and innocent girl breaking through the shell of a brooding hero with a dark past. But then that is not all. There are lot of adventures, back stories, fights and cool villains. There is even an element of fantasy in the fighting techniques. That way it straddles two genres that my blog is dedicated to – historic as well as fantasy. Of course the history part comes only from the era – the characters as such are fictitious. The story begins with a lot of back story – Kenshin is shown to be a dreaded political assassin. This gory profession however leads to a sad end – the death of the love of his life. This earth shattering event changes his life irrevocably – he decided to give up his profession and lead a peaceful life while trying to find atonement for his sins. So he discard’s his assassin’s sword and wields instead a reverse blade – a type of sword with its sharp edge pointed towards the wielder and can only be used for defense. He becomes a wandering swordsman who goes around the countryside helping people. It is during one of his wanderings that he comes across Kaoru who runs a martial arts school. He helps defend her against a villain who is trying to take over her school. That is where the story begins. The story is potpourri of multiple elements. Of course there is the strong romance element that over time helps Kenshin overcome his feeling of remorse over his past and reconcile himself with his current life. There is friendship – there are quite a few interesting characters in the village who befriend Kenshin. There is philosophy – Kenshin suffers existential crisis – he keeps brooding all the time and reflecting on his purpose in life. Then of course there are the adventures and fights. As with most anime, fights focus on techniques and they make interesting watch for a geek. Though it has fantasy element to it, it is made to feel real with all the details. We also see the emotion element as a key to winning fights and we are shown how Kenshin needs to overcome mental blocks and find answers to existential questions in order to win his fights. The story is also richly scattered with humor with Kenshin and his friends indulging in lot of light hearted banter, leg pulling and pranks. Though in some ways, the story presents in multiple arcs, which are standalone stories, most of them have linkages to Kenshin’s past and with each incident the characters are shown to evolve. That way there is continuity. This is a story that has something for everyone and not just fantasy or history buffs. The history buff may actually complain about inaccuracies in the history and the fantasy buff may refuse to acknowledge it as a full blooded fantasy – it is more of an urban fantasy in historic setting. I love the premise here actually. Guess you have a liking for historic romances. yes - I do as befits someone who started the reading habit with "Ponniyin Selvan" and, later, "Ivanhoe" and the "Three Musketeers"